Last week, we celebrated 100 episodes of the Win A Pageant podcast. It is such a joy to be guiding you on this pageant journey. I’m thrilled to be your captain! Since the beginning of the podcast in 2015, a lot has happened. I wanted to give you the updates of where we’ve been and also some insights as to where we’re going for the next season of Win A Pageant. I’ll break this into each element of the brand and share what we’ve done in the past and the vision for the future. There are three main components to success in any area of life: Strategy, Application, and Community. The first 100 episodes focused on strategy. I presented step-by-step trainings to guide your pageant experience. As a trained teacher, my bachelor’s degree is Education and my masters is in Adult Learning I believe I’m skilled at delivering step-by-step instruction on how to achieve your intended outcome. In the upcoming season of the podcast, I want to focus more on Application and Community. Individual application is when you take strategy, lessons, education and apply it to your own situation. It like learning how to add and then actually applying addition to your real life. Children tend to learn best through memorization and action, but adults learn best through application and example. That’s why in 8th grade, your tests are about Joanna cleaning a bus in 22 minutes and Carl cleaning it in 38 minutes, so how long will it take them to do it together. But, as an adult, we ask questions like, well, do they have time to plan before they start washing? and do they have to both be working at the same time? and Doesn’t Carl know a guy who cleans buses for $15 in under 5 minutes, why can’t we just take the bus to him? Sooo… for adults, application is key. I get emails, phone calls, Facebook messages, and YouTube comments with specific questions, but it’s hard for me to really give a good answer over those platforms. The third key element of success is Community or environment. You are a product of the people you spend the most time with. So, in addition to hearing my voice each week, I want to introduce you to some other influencers in pageantry. I want to help bring my community to you. You’ll see more and more interviews with directors, titleholders, even past titleholders, make up artists, stylists, anyone that I think would bring you amazing value and add to your life. That’s what to expect for the future of the podcast. Now, let’s talk about YouTube! 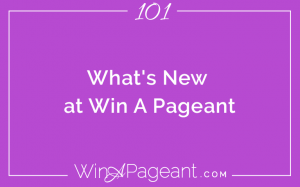 In celebration of the 100th episode, I launched the first Win A Pageant book called Beauty, Truth and Grace: Pageant Coaching to Win on Stage and in Life. This is a beginning-to-end pageant manual that includes all the aspects of pageantry you’ll need to know to decide which pageant to compete in, prepare to stand out from the others, perform as a pageant professional, and be a fabulous titleholder that leaves a powerful legacy. In less than 24-hours the book became a Bestseller on Amazon – can you believe that?! I was so flattered, but also it helped me see how much this type of information is needed in the pageant industry. When the book first launched, only the Kindle version was available. This week, the paperback version of the book launched. If you’re the type of gal that prefers to hold the book – maybe you want to make notes in the margins or highlight your favorite part – then this is for you. Right now, you can get the paperback version of the book. Amazon won’t let me do it for 99-cents because they have to also ship the book to you, but I wanted to make it low enough that it wouldn’t be a burden for those of you who know you need this book. Since 2015, I’ve created several pageant products and coaching programs, including the Art of Pageantry, Sponsor Success Formula and the VIP program. Those three programs have since closed. Now, my private coaching comes in 2 forms: Skype Mock Interviews and my signature program, the Pageant Interview Game Plan. Skype Mock Interviews are meant for the woman that has been listening to the podcast or read the book or studied the course and is ready to test her abilities. It’s a 45-minute Skype video call where we do several interviews with feedback after each one so you can improve every time. I also record these calls so that you can see yourself and how you did for your own personal critique. It’s also cool to see how you improve after implementing the feedback I give you right on our call. Mock interviews are available for $150. The Pageant Interview Game Plan launched in September 2016. It’s a 4-week online course that walks you through all the elements of branding, communication, preparation, platform and delivery to nail your pageant interview. It covers everything you could imagine that needs covered to ace your pageant interview. Political, Current events, and Controversial Questions? Yes. Opening and closing statements? Covered. Paperwork? Podium? Communication? Yes, Yes, yes. What the judges are looking for? I’ve got ya covered, girl. And, one of the best parts is our private Facebook Group. All the members of the Pageant Interview Game Plan get access to the private Facebook group where they can ask me anything! In that group, I’ve reviewed homework, created legacy projects, approved wardrobe, shared products for curly hair, fixed paperwork, and improved bios – the whole sham-wow! This is the best-of-all-worlds program. It’s a fully supported self-study course with direct access to the coach. Right now, the program is priced at $297. My goal this year is to expand my reach through public speaking, media appearances, and marketing in order to grow our Pageant Interview Game Plan community. I purposely made the program cost less than an evening gown so that the women who are serious about winning would be able to get the training they need and surround themselves with a community of go-getters. I love interacting with these women daily in our Facebook Group and can’t wait to do more meet-ups throughout the country for these clients. My hope is that the Win A Pageant brand encourages you to shine your light to those around you, lift up other women on our quest for greatness, reach your highest potential, and leave a legacy of love in this world. One common misconception of winning a pageant is the idea that when you win a pageant, you’ll be swept away into some fairytale land where you get a business manager, PR specialist and full glam team. The reason people believe this is because this is what happens in some pageants – namely Miss USA or Miss America. 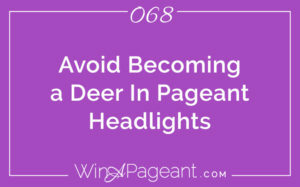 But, for most pageant winners, this is not the case. In fact, when you win your pageant you are actually expected to be the one to book your own appearances. Sometimes, you are contractually obligated to do 2 or more per month, so this is a necessary skill long before you win the title. 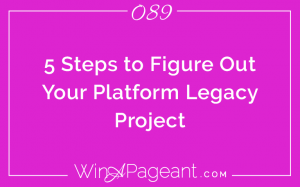 In this episode I’m going to share with you the 7 steps to book appearances like a true pageant professional with or without a crown. One of the greatest skills that pageant women learn is to convey memorized material in a way that feels new every time. It’s a secret of actors, speakers, and media professionals. And it’s a vital skill to win a pageant. Usually, when a woman attempts to memorize a speech, it generally loses emotional qualities that make it feel real, relatable, and engaging. 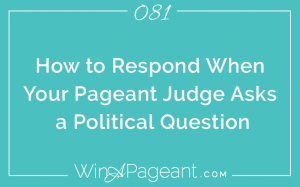 One of my greatest pet-peeves, and that of every judge and pageant director, and audience member… is a boring, monotone on stage introduction or answer to an on-stage question. It’s painful to listen to, makes you pity the poor girl, and gets hideously low scores. I’ve heard so many well-written introductions that get wasted away with no emotion. In this episode, I want to teach you how to add emotion into your introduction to help you memorize it without boring the audience, but rather spiking their attention.